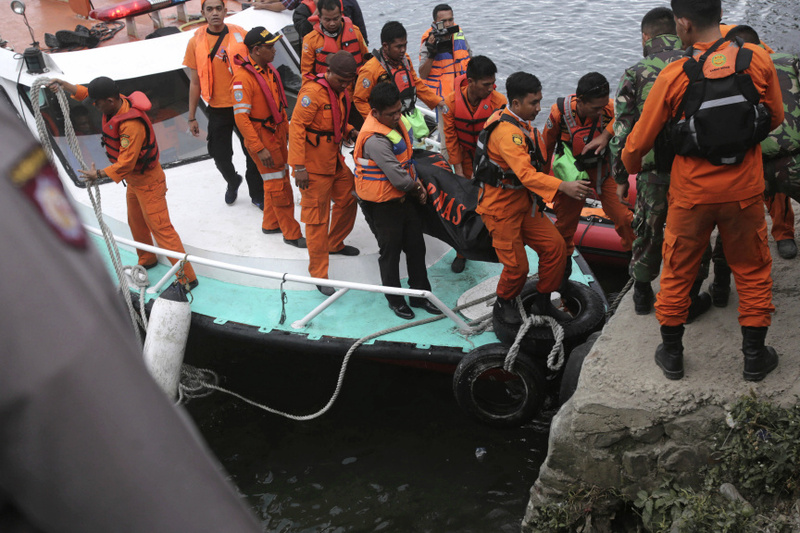 TIGARAS, Indonesia (AP) — Distraught relatives slammed Indonesia's government for not enforcing basic safety measures on passenger boats and pleaded Wednesday for a bigger search effort for at least 178 people missing since a ferry sank on a picturesque Sumatran lake early this week. The wooden vessel, overcrowded with passengers as well as dozens of motorbikes, didn't have a manifest and disaster officials have several times raised the number of people it was carrying as family members who rushed to Lake Toba in northern Sumatra provided information. Only 18 survivors have been found — in bad weather within hours of the sinking Monday evening. It's possible many of the victims were still inside the sunken ferry, said North Sumatra province police chief Paulus Waterpau. "Many survivors told authorities that less than half of them had jumped into the water before the boat sank," he told The Associated Press. Suwarni, whose 20-year-old son and his girlfriend were on the ferry, criticized the search and rescue operation as slow and insufficient. "Millions of questions keep me from sleeping," she said between desperate sobs. "Why a boat for just 50 people is allowed to be loaded with almost 200 people plus dozens of motorcycles," said Suwarni, who uses one name. "What kind of government is this that can't protect their own people from unnecessary accidents? And after the accident they're not able to find the victims," she said. "I beg help to everyone to quickly find my son and his girlfriend, even if their remains, please find my son, return him to me." Divers were searching at depths of 25 meters (82 feet) and will deploy an underwater drone to 200 meters (656 feet) below the surface, Waterpau said. The 1,145-square-kilometer (440-square-mile) Lake Toba, formed out of an ancient super volcano, is a popular sightseeing destination on the island of Sumatra. It's more than 400 meters (1,312 feet) deep. The search and rescue effort involving 350 personnel and at least half a dozen boats has turned up items of clothing, bags and traces of oil from the ferry but just several victims. Hisar Turnit, a spokesman for the search and rescue agency in nearby Medan, said three deaths were confirmed after two more bodies were found on Wednesday morning. Survivor Juwita Sumbayak, from Medan, said she had crossed the lake many times on the same boat but on Monday it was terribly overcrowded because of holidays for the end of the Muslim holy month. In an interview with AP, the distraught mother wept uncontrollably and called out the names of her husband and children who she believes drowned inside the boat. She said that about 20 minutes into the journey, strong high waves caused the ferry to list to the right and take on water, sparking a panic among passengers. Then it was smacked hard by more waves and an empty small wooden boat. The ferry seemed to shake, Sumbayak said, then suddenly capsized. Cellphone video released earlier in the week by the National Disaster Mitigation Agency showed the crew of another ferry attempting to rescue people struggling in the waters shortly after the sinking but being hampered by bad weather and rough waters. The disaster has cast a tragic pall over the holidays marking the end of Ramadan when tens of millions of Indonesians return to their hometowns. A grief-stricken Muhaimin, 61, said he had lost eight members of his family including two sons, their wives and children. "My sons, my daughter-in-laws and my grandchildren have been the victims of greedy businessmen who just want to take advantage of the holiday season without thinking of people's safety," he said. "It would not happen if they follow the rules. But they made money over our misery."